I have noticed a few museums have started to blog. Some of these have been around for a while now, some are new. Several are pretty inactive. I am sure there are more out there that I do not know about, but for now I have pulled out the blogs from my Paleontology and Geology Blog Lists (found on the sidebar to the right) and made a new Museum Blog section. 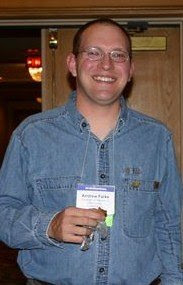 These are mostly blogs that deal with paleontology and geology subjects. If you know of any others I can add please let me know! I have so many other, more "colorful" pictures of Andy that are far better than this. And it is true, he does have a job now. But as a birthday present I will continue to hold onto them. Some day...... ;) Happy Birthday Andy! Welcome to the third installment of Fieldwork Friday! This week we are headed out to the Marble Mountains of California this weekend to collect trilobites from the Lower Cambrian Latham Shale, below cliffs of Chambless Limestone. Last April the museum took a collecting trip out and came back with more than 147 specimens for the museum collections. While trilobites are invertebrates and are legally collectible from BLM land (reasonable amounts for personal use, no permit required), when collecting large amounts for research you do need a permit (which the museum had). But what is a "reasonable amount?" According to the Utah BLM website, which has a nice descriptive paleontology section, "You may collect common invertebrate and plant fossils for NONCOMMERCIAL purposes only. A reasonable amount is what you may keep for a personal hobby collection or display in your home. Collecting common invertebrate or plant fossils for landscaping (even if it's just around your house) is not a hobby activity and must be done as a mineral materials sale." [link] If you are wondering if you need a permit, check out this link. And the brachiopod Paterina pospectensis. Below are some pictures of last years trip. I will be sure to post pictures of our trip when I have internet access, hopefully before next Friday. One of the museums great volunteers, Darrell, and a trilobite he found. More pictures to come! Have a great week! Rattlesnake Monocline is located in Horsethief Canyon along the Colorado River in western Colorado, near Loma. This monocline is easily accessible via two methods: road and river! I have been by it many times via raft (and hopefully many more this summer by our new canoe!). It was only a few weeks ago that we finally figured out how to see it from dry land, and with quite a great view! The picture below is from the land view (see directions below to the site), looking to the southwest. As you can see, an nice fault cuts the area, with the up-thrown block to the west. This pushed up the Wingate Sandstone, Kayenta Formation, and Entrada Sandstone in this area. Unfortunatly I have not been able to find much published on the geology of this area. I just thought this was a really near (local for me) feature that should be shared! Here is a map to see the monocline via road. Take I-70 to exit 2 (the last exit in western Colorado!) and take the dirt road that does back towards the east, paralleling the interstate. When you come to a branch, take the western one and it will take you to the river over look. There is an awesome picnic bench here (very random place for a picnic bench!). Area in the circle is view in picture above. 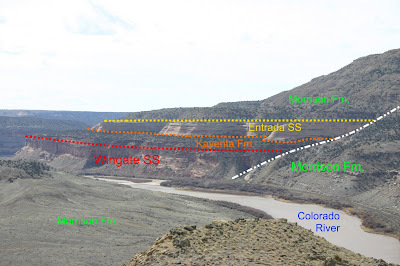 The second method is via the beautiful Colorado River! 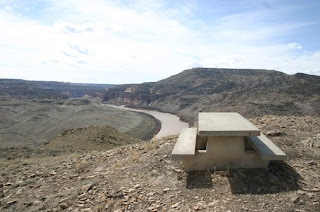 If you put in at the Loma Boat launch area, the Monocline is only ~9 miles down river, just past the Crow Bottom. Mile 141.5 has the best river view. Area in the circle is view in picture above. Here is a nice link about the float. Paleontological Resources Preservation Act (PRPA) Passes!!! A special session on the history of fossil legislation at the 8th Conference on Fossil Resources in St. George will be held during that meeting. Other blogging on the bill passing here. Now many regulations are going to be worked on so keep an eye out for the comment period. We need to make sure our comments are heard as these things begin to take shape. Congrats to everyone for all of their hard work on this bill!! Unfortunatly this week I did not get out into the field and due to a pretty busy week, I have not had a chance to put together a post on previous fun field work excursions. However, I strongly encourage you to take a trip over to Virginia Museum of Natural History's "Updates from the Vertebrate Paleontology Lab." Alton Dooley has put together a nice series on field work he and a groups of students representing four different schools are doing at Carmel Church! Thank goodness it is finally here!!! We are that much closer to summer. Thank goodness!! The International Herald Tribune reported Thursday that Nate Murphy is expected to accept a guilty charge and plea bargain on the federal charges of fossil theft, according to court documents filed on Wednesday. Murphy faced up to ten years in prison if convicted. "Murphy's case offers a rare glimpse into the illicit underside of paleontology, in which wealthy collectors are willing to pay hundreds of thousands of dollars for rare or unusual specimens. This weekend, a 150-million-year-old dryosaurus fossil taken from private land in Wyoming is expected to be auctioned for up to $500,000 in New York through the I.M. Chait Gallery. Josh Chait, who runs the gallery, said the sales create financial incentives for exploration that can lead to groundbreaking discoveries. Federal law generally prevents the removal of bones from public lands without a research permit. But the remoteness of many prime fossil grounds in Utah, Montana, Wyoming, Colorado and other western states makes enforcement difficult. "There's probably somebody out stealing fossils from federal land in Montana today, and we don't know about it because there's not enough law enforcement to patrol all of these sites," said Martin McAllister, a private archaeological investigator from Missoula. Thanks to Rebecca for these recent updates on this story. You can read the progression of this story on the blog here. The Omnibus Public Land Management Act of 2009 bill was passed by the Senate today (Thursday) and is heading to the house tomorrow. The bill only needs a 50/50 vote to pass! Hopefully it will be taken up tomorrow (Friday) and if not, early next week. Looks like there is still hope for the PRPA! HR 146's prospects there are better because House Democrats have indicated they would bring it to the floor in a manner which would allow it to pass with a simple majority. They also appear likely to permit amendments this time since several Democrats voting for S. 22 on Mar. 11 expressed reservations and suggested changes. The bill received 282 yes votes and 144 no votes. Greg has asked me to pass this along. It sounds pretty cool! Let me know if any of you are thinking of submitting something. I would love to see what kinds of entry's they get. It can't get much better than geology + art! Two Wall Gallery on Vashon Island, Washington, announces a call for artists for an upcoming exhibit entitled Geo sapiens, The Fusion of Geology and Art, to be shown during November, 2009. The theme is centered on incorporating geologic principles or features in art, building upon the observation that earth scientists think in ways that are different from the general public but fundamental to our understanding of the universe. Works that incorporate geology to make statements regarding an issue of relevance to society are appropriate, as are works that simply celebrate geologic thought. Works in all media are invited. Entry is open to degreed earth scientists and students studying earth science topics. You do not have to be a practicing or employed geologist to apply. All earth science professionals (geophysicists, geochemists, petrologists, paleontologists, etc) are included in our invitation. Up to three works may be submitted as slides or on a CD. For a complete prospectus and submission directions, contact Greg Wessel at SleepingDogCafe@aol.com. Submissions will be accepted until August 1, 2009. Petrified Forest National Park has a few internships and interpretation jobs available! Check out the notices below (Internship is in green, Interpretation job is in purple). Good luck to all who apply! Petrified Forest National Park in northeastern Arizona (USA) is looking for paleontology/geology summer interns to help conduct an ongoing inventory of paleontological sites in the park. 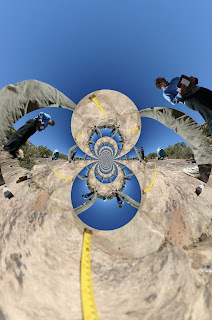 This is a fieldwork based inventory in which participants will be part of a team effort to survey for paleontological sites in a newly acquired expansion of the park. Interns will record data relevant to each site including GPS coordinates and photographs as well as geological and stratigraphic data. Participants will also be involved in the collection and excavation of fossil sites. In addition, participants will help prepare fossil specimens in the park preparation facility. This is an excellent opportunity for students to gain experience in basic geological mapping, field exploration, collection techniques, fossil preparation, and to become familiar with the role of the National Park Service in resource protection. The exposures in the park are Late Triassic in age and contain early dinosaurs, labyrinthodont amphibians, and many crocodile-line archosaurs and well as numerous plants and freshwater invertebrates. This position is based out of Petrified Forest National Park, which is 24 miles east of Holbrook, Arizona on Interstate 40. Park housing is available and free of charge for all interns. A meal reimbursement of $150 per week is also available. Housing for this position is a three bedroom house. Kitchen, bath, dining and living rooms are shared. Bedroom may be shared. Houses are located at the park headquarters. Although not required, applicants are advised that a personal vehicle will greatly help accessing services such as groceries, doctors, and other amenities. This position is for 10-12 weeks starting in the middle of May 2009 and continuing through August. Work is primarily performed outdoors, often under adverse weather conditions including extreme heat and daily thunderstorms. Participants may be required to hike long distances in rough terrain in a hot, dry climate sometimes carrying heavy loads up to 60 pounds. Work requires long periods of bending, stooping, walking, climbing and working in cramped positions. Work is often performed in backcountry or wilderness areas of the park. Applicants should have a background in paleontology or geology, a basic knowledge of fossil resources and their preservation, and have a working knowledge of computers. Familiarity with the paleontology, especially the paleobotany, of the Late Triassic is helpful but not necessary. Basic knowledge of GPS and GIS is also helpful but not required. For more information regarding this position please contact Bill Parker at Petrified Forest National Park. E-mail: William_Parker@nps.gov; Phone: (928) 524-6228 x262. Petrified Forest National Park in northeastern Arizona (USA) has openings this summer for paleontology educators (interpreters). These positions (2-3) are open for interested students and involve acquiring experience with the geology and paleontology of the park through working with the park paleontologist and geologist in fossil prospecting, learning fossil collection techniques (including excavation), documenting new and historic localities, conducting basic geological mapping and stratigraphic work, learning fossil preparation, and becoming familiar with the role of the National Park Service in resource protection and resource interpretation. The exposures in the park are Late Triassic in age and contain early dinosaurs, labyrinthodont amphibians, and many crocodile-line archosaurs and well as numerous plants and freshwater invertebrates. Students will be required use this acquired paleontological and geological knowledge to work with park staff to develop interpretive (educational) programs and products for visitors. These positions will be instrumental in presenting new paleontological and geological research to park visitors. These positions are based out of Petrified Forest National Park, which is 24 miles east of Holbrook, Arizona on Interstate 40. Park housing is available for rental by seasonal employees. Housing available for rent are shared three bedroom houses. Kitchen, bath, dining and living rooms are shared. Bedrooms may be shared. Houses are located at the park headquarters. Although not required, applicants are advised that a personal vehicle will greatly help accessing services such as groceries, doctors, and other amenities. These are temporal seasonal (STEP) positions available only to enrolled students. Please note that these are salaried, full time (40 hours per week) positions. The base position is at the GS-5 grade ($14.74/hour), although less qualified students may be hired at a lower grade. Work starts in the beginning/middle of May 2009 and continues through August. Position start and end dates are flexible based on school schedules. All Federal salaried positions are dependent on the applicant passing a background check. Work cannot start until a successful background check has been completed. Proof of current enrollment in an accredited college or university (official or unofficial transcripts) is required. Applicants should have a background in paleontology or geology, a basic knowledge of fossil resources and their preservation, and have a working knowledge of computers. Familiarity with the paleontology, especially the paleobotany, of the Late Triassic is helpful but not necessary. Basic knowledge of GPS and GIS is also helpful but not required. Strong communications skills and a willingness/comfort level to address park visitors and groups is a must. To apply send a current resume and the names and phone numbers of two references to: Bill Parker, Division of Resource Management, Petrified Forest National Park, PO Box 2217, Petrified Forest, AZ 86028. Please state that you are interested in the paleontology-education position. Congrats to Josh Mathews on his first publication! And in Journal of Vertebrate Paleontology of all places! Josh has worked with the Burpee Museum of Natural History for quite some time and is finishing up his Masters degree at Northern Illinois University. I have known Josh for a number of years. We both worked on very similar Master's projects, so we have been in contact quite a bit over the years helping each other out. 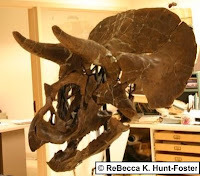 I know I was thrilled when I found out about this site - finally, a Triceratops bonebed! It has been interesting to see the project flesh out and to finally have the paper in print! Josh and the Burpee crew found 130 bones and bone fragments belonging to Triceratops in the Hell Creek Formation during exploration between 2005 - 2007. The remains, found in a massive mudstone, indicated a minimum number of three juvenile individuals, based on the presence of three left nasals. The site was dominated by cranial and appendicular elements, with analysis showing that the remains were sorted by currents, washing away smaller elements. This site is the first published occurrence of a Triceratops bonebed. "Ceratopsid dinosaurs are some of the most common fossils in Upper Cretaceous terrestrial strata of western North America. They are often found in bonebeds, which are accumulations of vertebrate fossils from more than one individual that are concentrated along a bedding plane or throughout a single bed (Eberth and Getty, 2005). For example, 20 bonebeds have been reported from Dinosaur Provincial Park in Alberta, Canada, which contain Centrosaurus and Styracosaurus (Visser,1986; Ryan et al., 2001; Eberth and Getty, 2005). Additional bonebeds from localities across western North America have yielded remains of Agujaceratops (Lehman, 1982, 1989, Lucas et al., 2006), Anchiceratops (Dodson, 1996, Ryan et al., 2001), Einiosaurus (Rogers, 1990, Sampson, 1995), Pachyrhinosaurus (Langston, 1975; Tanke, 1988; Ryan et al., 2001), Styracosaurus (Dodson et al., 2004), Torosaurus (Hunt, 2005), and Zuniceratops (Wolfe and Kirkland, 1998). Some of these bonebeds contain the remains of hundreds to possibly thousands of individuals and represent catastrophic mass death assemblages that strongly indicate herding behavior (Eberth, 1996). Others contain significantly fewer individuals, with some preserving fewer than five. Although Triceratops is the most common dinosaur in the terminal Cretaceous Hell Creek Formation (White et al., 1998), known from over 50 singleton specimens collected since the late nineteenth century, no bonebeds or associations of multiple individuals have previously been reported. 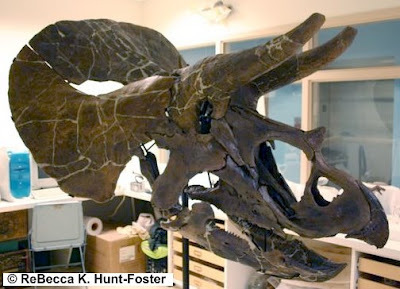 A new locality in the latest Maastrichtian Hell Creek Formation of southeastern Montana, discovered in the summer of 2005 by a field crew from the Burpee Museum of Natural History (BMR) in Rockford, Illinois, contains the remains of three juvenile-sized Triceratops. This is the first occurrence of multiple individuals of Triceratops in the same quarry and raises potentially interesting questions regarding Triceratops paleobiology." Homer the Triceratops at the Burpee Museum. See more pictures here. The workshop web page above has links to the workshop overview, the application form, and the faculty endorsement form. (applicants will need to ask a faculty member to endorse their application using the on-line form - endorsement to be submitted by March 25). This workshop is designed specifically for graduate students and post-doctoral fellows who are interested in pursuing academic careers. The workshop will include faculty panels on academic careers and the academic job search, short presentations on various topics, structured discussions, and informal interaction and conversation. Participants will leave with a broad understanding of academic options, specific strategies for developing as teachers and scholars and for meeting competing demands, and an expanded network of colleagues. Faculty members and administrators will provide guidance and information that will help participants to be stronger candidates for academic positions and to succeed in academic jobs. Session topics focus on becoming both a successful teacher and researcher. The workshop size is limited. Preference will be given to those entering or soon to enter the academic job market. The workshop application must be completed on-line by March 18. Many of the operational costs of the workshop as well as on-site expenses are covered by a grant from the NSF Division of Undergraduate Education. Participants or their home institutions must provide transportation to and from the workshop. We have some funds for workshop/travel stipends and will provide more information about those after application decisions are made. I realize this is almost late. But it is still Friday where I am. I had hoped to post something earlier in the day for this new series, but unfortunately it didn't pan out that way. I was lucky enough to get out into the field twice this week! The first trip out was to a site that is not being worked by myself, but by a fellow paleontologist. The second trip was out today to prospect more of Rabbit Valley, like last week. I had held off on posting in hopes of finding something cool I could talk about today, but that was not to be. We did find quite a bit of fossilized wood, probably in the Dakota Formation (fall blocks), but was very scrappy. The work we did earlier this week was visiting a track site in the Morrison Formation north of the Moab, Utah area on BLM land. It was very interesting to see and I look forward sharing a link to the research once it is published. It was nice to also get out and see some great geology. The area around Moab is always fun to see and think the geology is excellent! I always see something new on every trip. We were able to walk from the Morrison Formation to the Entrada Formation (also Jurassic in age) during our hiking that day, and had a great view of the La Sal Mountains in all their snowy wonder. I found two small, faint tracks in a sandstone covered in ripple marks from the lower Summerville Formation (picture on right). I also found an owl pellet (recent), full of tiny mouse bones, so that was a fun plus to poke that around. No fossilized bones on this trip. On the ride home we drove though the canyon along Highway 128 (see map below). This is a great drive! If you have never driven this route I strongly encourage you to. It follows the Colorado River for quite a distance and you are surrounded by great cliffs of Moenkopi, Chinle, Wingate, Kayenta and Navajo. 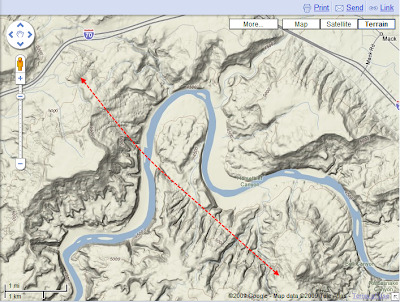 I know Silver Fox is familiar with this area, and she has many great post about it on her blog. I made sure to wave at Fisher Towers for her as we passed by. The sun was setting and it turned the Moenkopi and Chinle Formations turn an amazing deeper red. I hope to camp in the area some day so I can experience it again. Well worth it and a great way to send a fun day! Hope for the Paleontological Resources Preservation Act! So the Omnibus Public Land Management Act of 2009 is not totally dead! I was not fully aware of the situation yesterday, so sorry for my downer of a post. Below you can see a break down of yesterdays votes (from here): 282 Aye (248 Democrat, 34 Republican); 144 Nay (141 Republican, 3 Democrats). "John J. Duncan Jr. (Tenn.), who also is on the Natural Resources Committee, said in a floor speech that while the bill fell short of passage, members nevertheless voted overwhelmingly in favor of it. "All this really means is that it will now be taken up under regular order, where it should have been in the first place and which requires only a majority vote. Thus, there is no question this bill will pass the next time it's taken up," he said. [link]"
Till then, check out Fossils and Other Living Things which talks about yesterdays events towards the top of the post (also check out the column on the right). The S. 22, the Omnibus Public Land Management Act of 2009 that contained the Paleontological Resources Preservation Act (PRPA) did not pass. From what I understand it was two votes short. Bummer! The Paleontological Resources Preservation Act (PRPA) will be taken up on the House floor tomorrow (Wednesday, March 11, 2009). Be sure to write your representative TODAY and encourage them to vote in favor of S. 22, the Omnibus Public Land Management Act of 2009! See my former post for link to contact your Representative. I will update this story tomorrow as we find out what happens. Keep your fingers crossed!! An article in todays Great Falls Tribune reports that Nate Murphy pleaded guilty Monday to the state charges of fossil theft. Sentancing will be held May 27th. "Murphy, 51, was set to go to trial on March 18 but instead pleaded guilty in Phillips County District Court in Malta to felony theft....Separate federal charges of stealing fossils from Bureau of Land Management property are pending....Kevin O'Brien, spokesman for the Attorney General's office, which is prosecuting the case, said Monday that for now the raptor remains in the state's custody as evidence." You will likely see many post on field work taking place in Rabbit Valley (BLM land - permit required to collect vertebrate remains; the A is not marking anything particular, by the way). It is very close to the museum I currently work for. This past Tuesday the weather here was great (high of 72!) 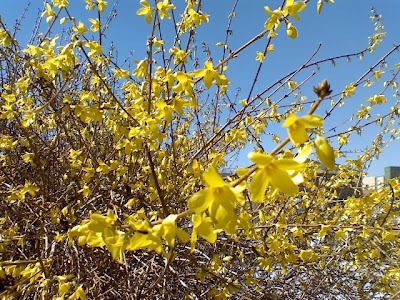 with a strong westerly warm wind. We (John and I) had a map a museum volunteer had made in 1977, which was recently relocated during a deep cleaning of the museum. He had marked several sites on this map he had located over the years, a few of which we already knew about and had been collected by the museum in many years past. This site we had not visited so we took advantage of the great day and went out. It was a bit like a treasure hunt, looking for the "X" on the map. And our treasure was buried. Deeply. It is not going anywhere any time soon. The past 30+ years had partially covered the site. It had originally be identified to contain "Supersaurus" vertebra (this is in the Brushy Basin Member of the Morrison Formation), but once we located the site we realized it was "just" a Diplodocus. I also found some turtle material while at the site, so that was fun! We plan on going back when the weather warms back up (we have a week of rain/snow in our near future). Below are a few pictures from our first day in the field for 2009!! Any material collected by myself are covered under a permit though the appropriate agency and curated at the appropriate repository, unless otherwise noted. Check out this video for the Joggins Fossil Institute in Nova Scotia, Canada. I have never been up that way, but it looks like a cool place. I'll have to find a chance to get up there. Have any of you been there before? Thanks to the Canadian Tourism people for the heads up. Nice job! Sorry for the lack of post. Things are picking up at work, and the nice weather even let us escape to the field today. Some of you may have already seen this video, but I thought I would pass it along. I wonder if it is available on iTunes? ?